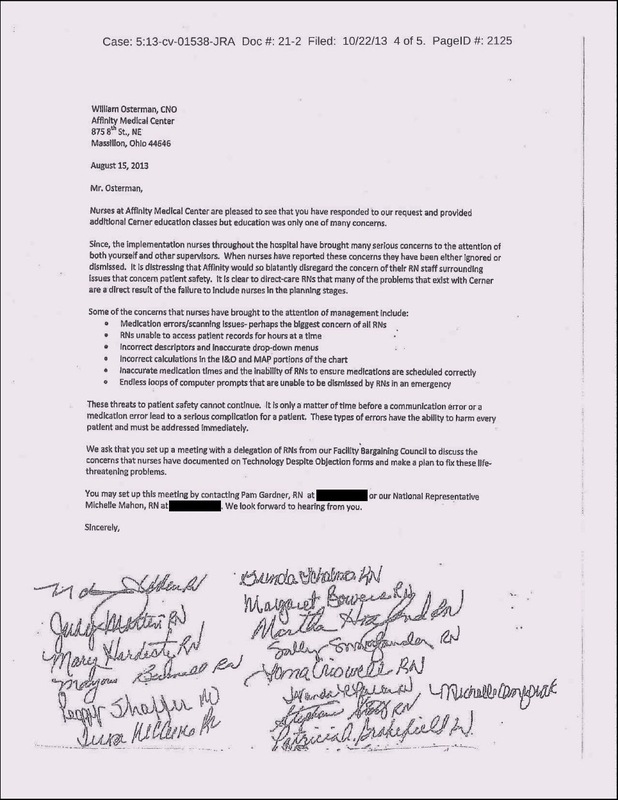 I've written previously about substantial problems nurses at Affinity Medical Center, Ohio (http://www.affinitymedicalcenter.com/) and other organizations are having with EHRs, and how hospital executives were ignoring their complaints. The complaints have been made openly, I believe, in large part due to the protection afforded by nurses' unions. See for example my July 2013 post "RNs Say Sutter’s New Electronic System Causing Serious Disruptions to Safe Patient Care at East Bay Hospitals" at http://hcrenewal.blogspot.com/2013/07/rns-say-sutters-new-electronic-system.html (there are links there to still more examples), and my June 2013 post "Affinity RNs Call for Halt to Flawed Electronic Medical Records System Scheduled to Go Live Friday" at http://hcrenewal.blogspot.com/2013/06/affinity-rns-call-for-halt-to-flawed.html, along with links therein to other similar situations. Particularly see my July 2013 post "How's this for patient rights? Affinity Medical Center manager: file a safety complaint, and I'll plaster it to your head!" at http://hcrenewal.blogspot.com/2013/07/hows-this-for-patient-rights-affinity.html, where a judge had to intervene in a situation of apparent employee harassment for complaints about patient safety risks. These threats to patient safety cannot continue. It is only a matter of time before a communication error or a medication error lead to a serious complication for a patient. These types of errors have the ability to harm every patient and must be addressed immediately. We ask that you set up a meeting with a delegation of RNs from our Facility Bargaining Council to discuss the concerns that nurses have documented on 'Technology Despite Objection' forms [complaint forms about use of technology with objections - ed.] and make a plan to fix these life-threatening problems. You may set up a meeting by contacting Pam Gardner, RN at [redacted] or our National Representative Michelle Mahon, RN. [For the National Nurses United labor union, http://www.nationalnursesunited.org/, with close to 185,000 members nationwide - ed.] We look forward to hearing from you. 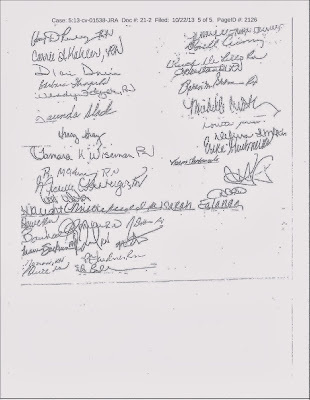 The letter is followed by the signatures of about 70 nurses. It is clear the administration of this healthcare system has been explicitly put on notice of likely if not imminent danger to patients by multiple qualified experts, its own RNs. If they do not act and patient harm occurs, it is my belief criminal negligence charges could be merited. I also highly doubt patients are informed of these EHR system 'issues' and have been afforded the opportunity to give informed consent to the use of these computer systems in their care, or to go elsewhere for treatment. These problems are repeating themselves over and over across this country and others, but many clinicians, especially those not protected to some degree by a labor union, do not speak out due to fear of retaliation. 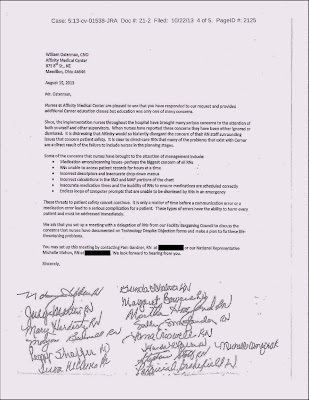 Let's hope the nurses who signed this letter don't get their complaints plastered to their foreheads, as some were threatened with as in the aforementioned post. The nurses and the doctors, being forced to use these instruments of care, are defacto guinea pigs for the vendor, as are the patients. It has been a standard established by early software producers such as $msft to put out their stuff and let the users (for free, and out of frustration) complain about the bugs and flaws which give the vendor the ideas needed to further experiment in the design. That was not life threatening for word documents, but it is for hospitals that are using software run ordering devices for critically ill patients. The nurses are being exploited by the vendor. They need to look at the mobey flow between vendor and hospital and its admin. The vendors are howling that regulation by the FDA would stifle innovation. Yet, based on what is described above, the vendor has demonstrated little to zero innovation despite not being regulated from the beginning. The only solution to address the HIT devives' defects, design flaws, poor usability, and the deaths, injuries, and near misses is FDA regulation. The nurses are being exploited by the vendor. Indeed. They are providing onsite beta testing. So are the patients - again, without any consent in place. Once again we see how government is unable to supervise large IT projects. EMR’s and Healthcare.gov are examples of politicians setting the standards with no professional background and relying on vendor input vendors whose only driver is profit. We really need politicians who can step back and allow professionals to supervise and implement these projects, and quit thinking that with a little more sales effort they can convince the American people how good their idea is and how all that wasted tax money is simply an investment. WHEN IS DISCLOSURE NOT DISCLOSURE?